Run natural in the next best thing to barefoot. The Nike Free Run+ is the latest in the Nike series inspired by barefoot training. 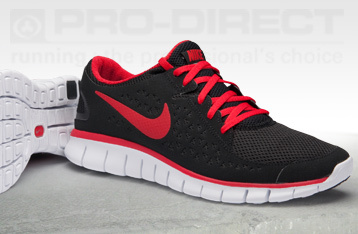 Nike Frees take natural motion technology and give your foot the freedom to move. Originally designed as a training aid and giving a barefoot like running experience, the unique design promotes freedom, increases flexibility and strengthens the foot. Free Run+ is ideal for the runner who wants the benefits of barefoot training along with the cushioning, traction and protection of a running shoe. Designed with a full bootie, the Nike Free Run+ gives you a customized fit and barefoot-like feel during your run. The lightweight mesh upper features a seamless forefoot for exceptional comfort. Sipes along the top of the midsole encourage toes to flex and grip naturally while engaging muscles normally neglected in traditional footwear. To get your feet even more engaged during your run, the Nike Free Run+ Running Shoes have deep flex grooves that enhance the foot's flexibility and stability. If you're ready for the benefits of barefoot training but require a running shoe with a plusher feel than others in the Nike Free line, don't overlook this shoe's heel design - a new addition to the series - which delivers a cushioning experience that won't compromise your flexibility.